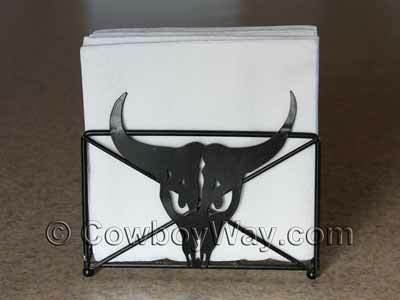 Below are cowboy, Western, and rustic napkin holders, along with related accessories, for sale on Amazon and eBay. Lower on the page you will also find a couple of videos showing you how to fold napkins into simple shapes. Below: A steer head design on a napkin holder. Instead of using a napkin holder you can create a beautiful table in another way by folding your napkins. Here are a couple of YouTube videos with simple napkin folding techniques, followed by a couple of books on Amazon.com loaded with napkin folding ideas and photos. A simple folded napkin that makes an attractive pouch for your silverware. A napkin folded into a pinwheel shape: It's a lot easier than it looks! Over 700 step-by-step photographs show you how to make stunning folds to a professional level. More than 1,000 photographs, spiral-bound.